Thanks to several readers and netizens for contributing to this post. 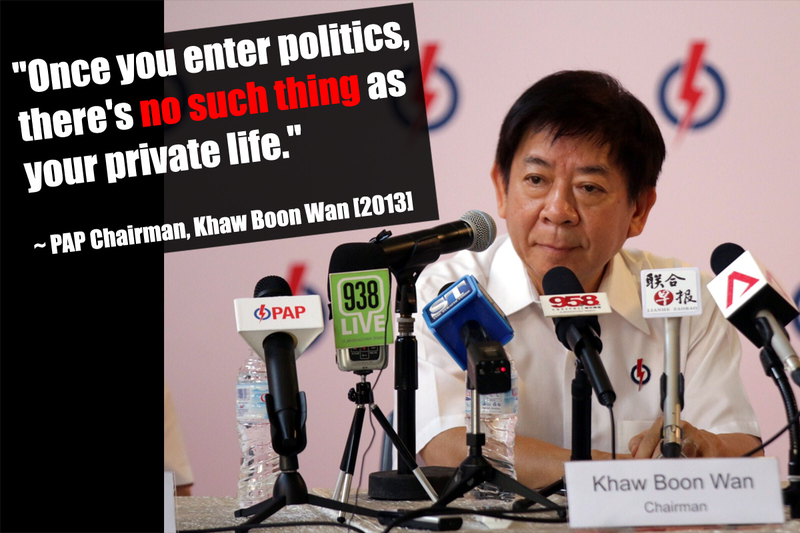 In 2013, Mr Khaw said that when a person enters politics, there is “no difference between his or her public and private life.” He said the same thing in 2012. 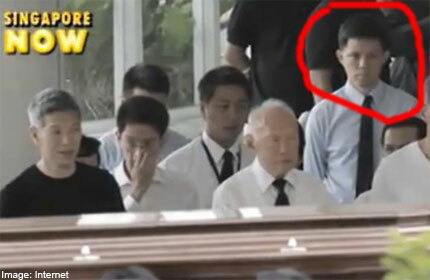 In 2011, a netizen posted a screenshot on a forum, which showed Chan Chun Sing standing behind members of Lee Kuan Yew’s family at the funeral of Mr. Lee’s wife, Kwa Geok Choo. Reader’s Comment: If Chan Chun Sing was at Kwa Geok Choo’s funeral in the “official capacity as the Chief of Army,” technically he should be dressed in formal military attire. Even then, he should be with other guests or military personnel. State-controlled newspaper, The Straits Times, mentioned that Chan Chun Sing’s parents are divorced (in an article dated 8 March 1988). His father’s name has not been mentioned. Chan Chun Sing and (most likely) wife beside him. The above two images are most likely of Chan Chun Sing’s wife, whose surname is Low. Her first name has not been mentioned. Marriage of George CHAN Chor Cheung to Monica LEE Kim Mon. Monica Lee (“Mrs. George Chan Chor Cheung”). Monica Lee (“Mrs. George Chan Chor Cheung”), on the right. George Chan Chor Cheung and wife, Monica Lee Kim Mon, in 1973. Monica Lee Kim Mon, who married a Chan, is the sister of Lee Kuan Yew. Her spouse was George Chan Chor Cheung, son of Chan Wing from Kuala Lumpur. Chan Wing made his fortune in 1897 at age 24 with the opening of Hong Fatt Tin Mine. He had more than 20 children and was the richest person in Kuala Lumpur up to 1941. Chan Wing and 15 family members studied in Cambridge University (LKY’s alma mater). He had residences in Hong Kong, Bangkok and Singapore. He passed away in 1947. George Chan Chor Chueng was a designer involved in the building of Jurong Bird Park [Kwa Soon Bee (brother of Mrs. LKY / Kwa Geok Choo) used to be the Chairman of Jurong Bird Park]. P.S. Chan Chee Chiu is a son of George Chan Chor Cheung. 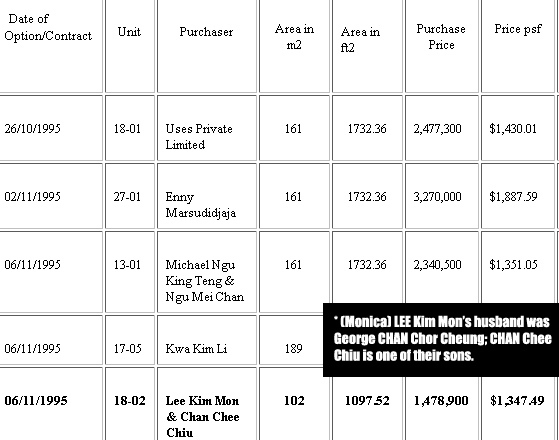 Monica Lee Kim Mon purchased a unit with Chee Chiu in the Nassim Jade scandal. Reader Tip: The marriage record of George Chan Chor Cheung and Monica Lee Kim Mon can be retrieved from the Singapore Registry of Marriages for the month of October 1951. Ho Ching’s mother’s name is Chan Chiew Ping. She was from Taiping, Malaysia. Alan Chan Heng Loon, Public Service Commission (PSC) Member and former principal private secretary to Lee Kuan Yew, has two “illustrious siblings“: Professor Chan Heng Chee and Chan Heng Wing. Alan Chan was Deputy Secretary of the Ministry of Foreign Affairs. Chan Heng Chee is Ambassador-at-Large for the Ministry of Foreign Affairs. Chan Heng Wing is a senior advisor in Singapore’s Ministry of Foreign Affairs. A “Leonard Cheng Tye Loke” in ICIJ’s Offshore Banking database (Singapore names). Mary Seet nee Chua Swee Neo (aunt of LKY). Source: Straits Times, Feb 1992. Mary Seet-Cheng is a Senior Specialist Adviser at the Ministry of Foreign Affairs. She is married to Leonard Cheng Tye Loke, and has the same first and last name as Lee Kuan Yew’s aunt (Mary Seet nee Chua Swee Neo). There is a “Leonard Cheng Tye Loke” listed in ICIJ’s Offshore Banking database. Reader Tip: Please note this important fact. LKY’s mother’s sister married a SEET whose family has many siblings. One of them, SEET LI LIN, has become NOTORIOUS because he is the right hand man of Malaysia’s Jho Low and the 1MDB Scandal. This has appeared even in the US media. Seet is the son of one of the siblings related to Arthur Seet Keong Hoe (son of Seet Cheng Kang, who married Lee Kuan Yew’s aunt). Seet Li Lin is a close colleague of Jho Low, both of whom are involved with the 1MDB scandal. 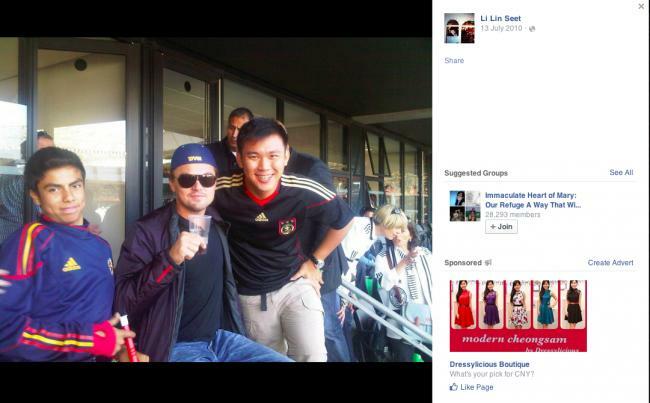 It is interesting that this “Seet Li Lin” has not been mentioned in local media such as The Straits Times. The PAP Manifesto reminds me of my best pieces of work in college: loads of nice pics, big on fluff, a light touch on content, says a lot yet very little, somewhat convincing but actually confusing. Most important of all, we always get away with it by gaming the system. 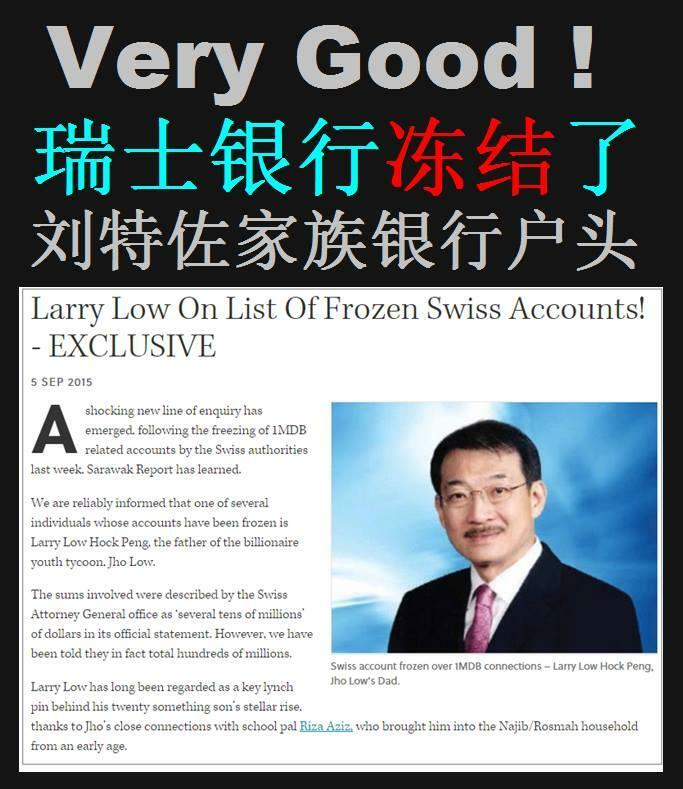 UPDATE (7 Sept 2015): According to Sarawak Report, Jho Low’s father, Larry Low Hock Peng, is on the list of frozen Swiss bank accounts. Ng Chee Khern was Chief of Air Force from 2006 – 2009. 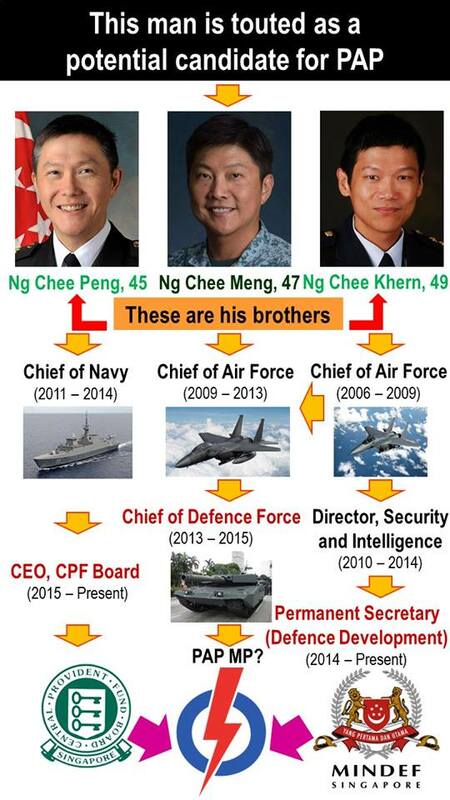 Ng Chee Peng was Chief of Navy from 2011 – 2014, and was appointed the CEO of CPF in Jan 2015. Former defence chief, Ng Chee Meng, has been touted as a potential office-bearer. 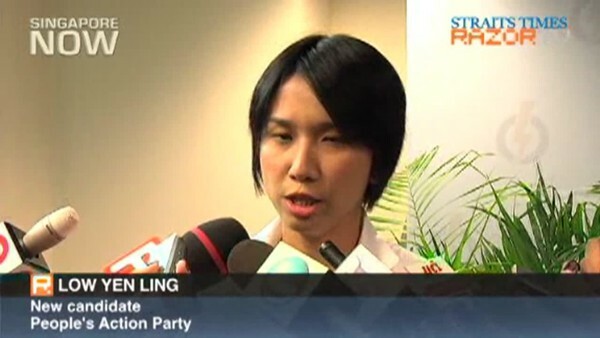 Ng Chee Peng’s wife is Valerie Low Yin Lee, who shares the same surname as the wife of Chan Chun Sing. Ng Chee Meng’s wife is Datin Michelle Lim Bee Leng. 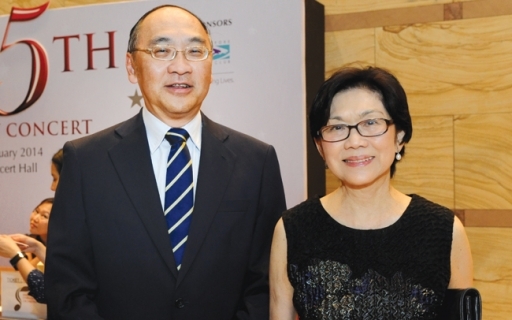 Ng Chee Khern’s wife is Elaine Ng, CEO of National Library Board. Ng Chee Khern and Elaine Ng Poh Choo. Ng Ban Hin and Lee Hang Foe are the parents of the Ng siblings. A photo of them is available on Page 9 in this PDF document. 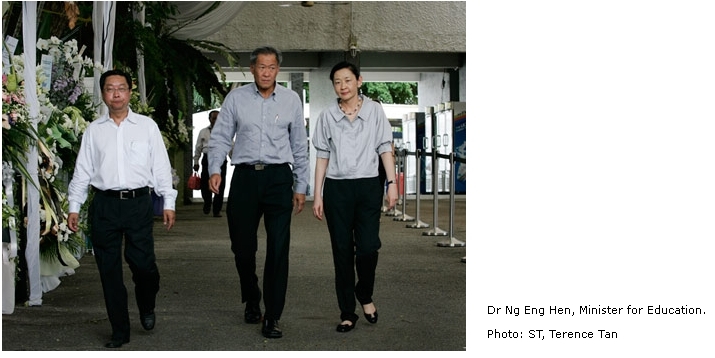 Prof. Ivy Lim Swee Lian, CEO of Singhealth, is married to Minister for Defence, Ng Eng Hen. Ivy Lim Swee Lian has the same first name and last name as Ivy Lim Seok Cheng, sister-in-law of Kwa Geok Choo (Mrs. Lee Kuan Yew). Ivy Lim Seok Cheng’s father was Lim Chong Pang, whose father-in-law was Lee Choon Guan. Lee Choon Guan co-founded the Chinese Commercial Bank in 1912. In 1932, the Chinese Commercial Bank and the Ho Hong Bank (founded by Lim Peng Siang) merged with the Overseas-Chinese Bank to form the Overseas-Chinese Banking Corporation (OCBC Bank). 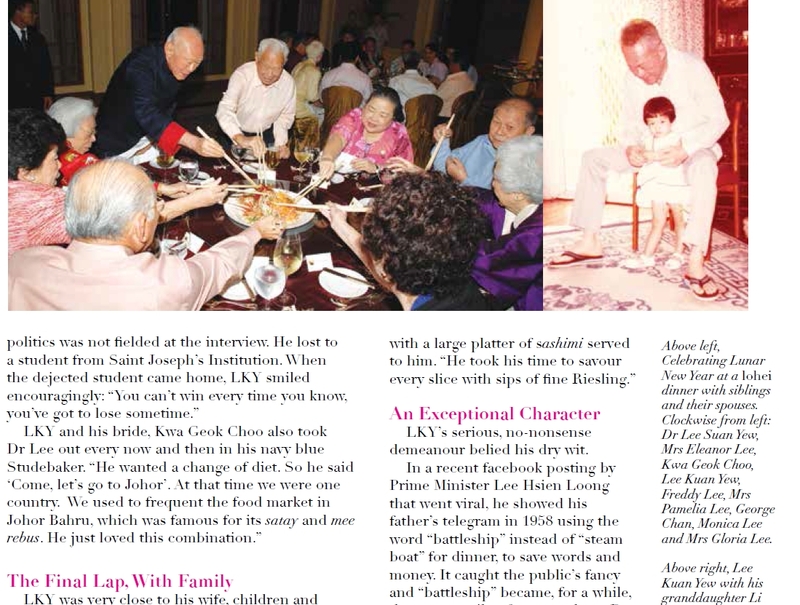 Ng Eng Hen is said to be the nephew of real estate tycoon, Ng Teng Fong (who had 10 siblings). Reader Tip: A forum poster said the Chinese newspapers mentioned Ng Eng Hen as “the nephew” of Ng Teng Fong. Does anyone have a newspaper clipping? Ng Eng Hen at the wake of Ng Teng Fong. The late Mr. Ng Teng Fong (founder of Far East Organization) was billed as Singapore’s richest man by Forbes magazine in September 2009. Robert Ng Chee Siong is the son of Ng Teng Fong. Robert Ng is a board member of Temasek and is married to Yeoh Saw Kheng (楊素瓊), the third daughter of Dr. Yeoh Ghim Seng, the former Speaker of Parliament of Singapore (Source: CapitalProfile PDF). 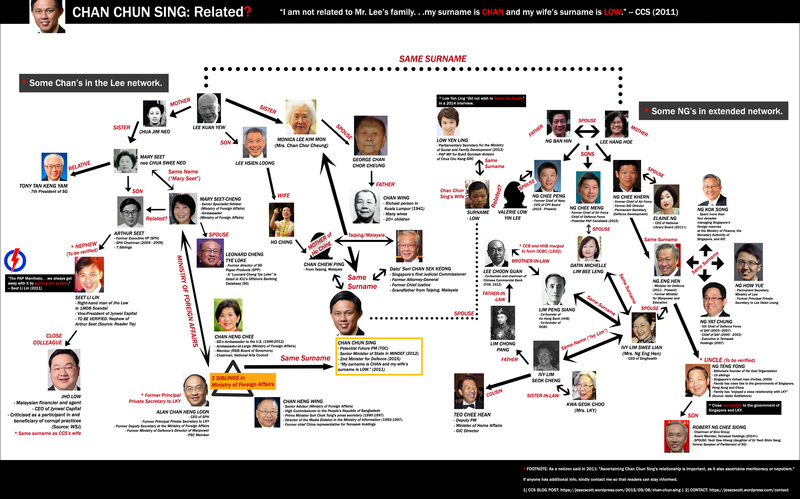 Ng Teng Fong’s family has close ties to the governments of Singapore, Hong Kong and China (Source: PDF document). The Ngs have also enjoyed a close relationship with Lee Kuan Yew. Low Yen Ling, Parliamentary Secretary for the Ministry of Social and Family Development, has refrained from revealing the names of her husband and her father in previous interviews. Could she be related to the spouses of Chan Chun Sing and Ng Chee Meng? Ladies & Gentlemen, I have always said that in Malaysia we are either related or friends with one another. 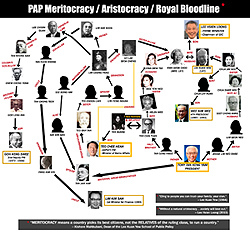 And in Singapore, those in power are related to one another.